Many elements of life remind us that the rationality upon which our society is founded is but a sham—love, parenting, picking out the right outfit. Severe morning sickness (HG) is one of those things where the rational mind searches for patterns and your stomach refuses to conform. I wish I understood the unspoken Spinx-like riddles of my stomach. So, yesterday when we were told the baby needed to gain more weight, and that I should ingest more caloric foods, I thought, “good luck.” Trust me, my limited diet is not a life-choice. It is more like someone imposing a cult-like diet onto me for 80 % of a year. But, I digress from the food. So, the doctor has said if you can only eat a little make it very caloric. Makes sense—the real estate is small make it worthwhile. But, the problem is finding caloric foods that will agree with me. And, there is no sense of what that would be. For a while, with my pregnancy with Belle, I decided to only eat what I was craving, figuring that my body had the secret answers. That didn’t really work. But, hope springs eternal, so we continue to try to find things that won’t upset my stomach. My husband decided to take on the proactive role. 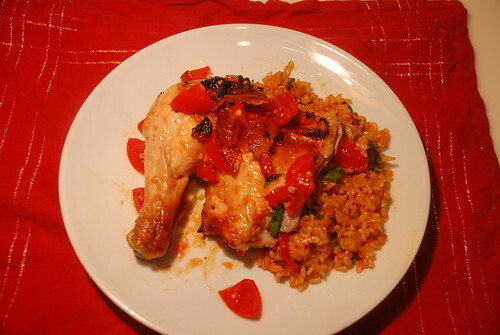 He made a roast chicken inspired by the most recent issue of Gourmet Magazine but wrapped in bacon and served with tomato, bacon fried rice. While the taste I had was delicious, my stomach chose to abstain. This is also our entry for the Royal Foodie Joust, which we are entering because we love Nuria. The ingredients were tomato, bacon and rice. As tomatoes are not at their peak right now here in the great state of Ohio, we used some cherry tomatoes, tomato paste, and tomato juice. Butcher the chicken to make it flat (either by cutting out the back or by following the Gourmet magazine description (which we did). Drape 3-4 strips of bacon over the bird. Put in a roasting pan and weigh down with 2-3 tin-foil covered bricks. Cook for 45 minutes at 500 degrees. wow..thats great news...good to see you back..Congrats!... :)...missed you in my recent melas..if you have time do drop in..hope the lil M is doing good..
Loving Nuria is a great reason to enter the Joust! :) So happy that both you and Nuria part of this competition! :) As per usual, your entry totally rocks! Hope your stomach stop wreaking havoc soon! Well is sounds dibine. Sorry the stomach didnt want to play this round. But your taste buds agreeed it was good.So baby steps. oh honey... i'm so sorry this didn't agree with you. i thought bacon would do the trick... the dish looks incredible. do things like ensure shakes work? ice cream? Srivalli: Thanks for stopping by. Belle is good--readying herself for the life changes. JennDZ - The Leftover Queen: thanks. Glad to be back. OhioMom: oh man, 5 pregnancies--amazing. cook eat FRET: oh, I have a six pack of ensure staring me in the face. But, dairy and anything liquid really make my stomach very sad. The dish sounds amazing ... the morning sickness, not so much! I've been there (twice) and although I love (adore, really) being pregnant I can certainly do without those first two months of you know what. Good luck--it'll get better real soon! Nice to see you back & blogging and this chicken dish is worthy of a drool or two! Maria: indeed, pregnancy is a means to an end. oh my, but this sounds amazingly good! I'm so glad you dropped by to comment on our eggs and Hollandaise! Sometimes I think the very notion of rationality is a sham, but we do what we can. We go on. Very intrigued about the green mango in the marinade -- and my that chicken quarter does look scrumptious!